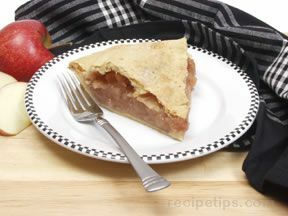 Crust: Combine flour, salt and sugar; mix together with shortening. Beat together water, vinegar and egg. Combine with flour mixture and form into a ball. Chill for 15 minutes. Can be frozen or refrigerated until needed. Makes 2 double and 1 single pie crust. Filling: Combine apples with flour, cinnamon and salt. Place in a pastry lined 8 in. pie pan. 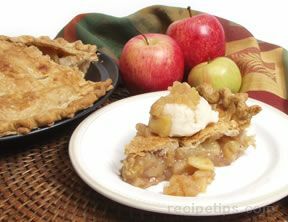 Dot butter on top of apples and place pie crust on top. Bake at 450° for 40 - 50 minutes. Sprinkle crust with sugar after removing from oven.